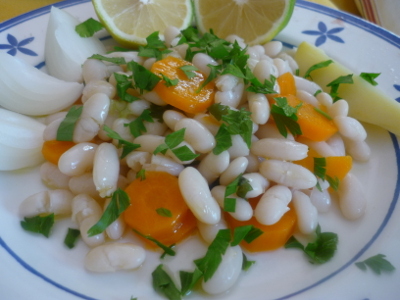 Fasolia – or boiled white beans – are one of the most common and most delicious meals you will find on a Greek kitchen table. Simply boiled with potatoes, carrots and parsley, fasolia can be eaten as a side dish, a main dish or even a cold salad – all of which are popular in the summer months. In the winter, we add a tomato sauce and make ‘fasolada’ – a warming bean and tomato soup. In fact, fasolada soup is actually the national dish of Greece (and not the well-known mousaka or dolmades), which goes to show how popular it is! Both fasolia and fasolada are perfect examples of the traditional foods that form part of the healthy ‘Mediterranean diet’, which has been linked to all sorts of health benefits. These meals are the poor man’s solace and the rich man’s luxury. Here’s how to make the light summer fasolia dish. Add fried onion and a tomato sauce to make the winter favourite, fasolada soup. ‘Kalopsita’ and ‘kakopsita’ refers to how well beans cook – some cook quickly and are more tasty (generally the fresher they are the quicker they cook), while others take longer. Keep an eye on your beans and cook them until you notice them start to split open. Add salt only at the end, otherwise the beans might remain tough. Greek people do not mind being served but they prefer to add olive oil, lemon juice, salt and pepper by themselves. Raw onions can be cut and served on a separate plate. You can also serve a plateful of cut tomatoes, cucumbers, and whatever other raw vegetable you have around.